ECO-03 | Size: 30 ml / 1 fl.oz. Combats dullness and fades pigmentation. Active ingredients: Vitamin C LAA (15%), Resveratrol, Red Grape Extract, Tightenyl™, Oat Kernel Extract, Melatonin, Acai Berry Fruit Extract. The serum is a powerful combination of pure 15% Vitamin C-LAA, Tightenyl™ - a new generation skin bio-lifter, potent antioxidants such as Melatonin, Resveratrol and Red Grape Extracts, and efficiently proved anti-aging ingredients like the Oat Kernel Extract. It was design to offer a total skin transformation. It promotes cells’ longevity, reduces the DNA oxidation, tightens and redensifies the complexion firmimg and toning sagging skin, reduces expression lines and wrinkles, erases dark spots and unifies skin tone. The product is non-comedogenic and it can be used by all skin types. Tightenyl™ rejuvenates the skin’s extracellular matrix and reorganizes the skin pattern from inside out. It improves skin tonicity, tightens, firms and re-densifies the complexion. Oat Kernel Extract is a 100% natural sugar tensor which provides significant changes in facial appearance affected by aging. It visibly firms complexion, ameliorates sagging skin, reduces expression lines and wrinkles, erases signs of fatigue. Use: Apply twice a day after cleansing and toning. Pour a small amount and smooth evenly over face, neck and décolletage. Massage the serum into the skin with circular movements, using the fingers. You may feel a warming, active and tightening effect but the sensation will disappear within moments after application. Leave the serum to act for at least 10 minutes and then apply your regular moisturizer. Clean the hands after the application as it may cause stains on dry skin areas, cuticles or clothes. 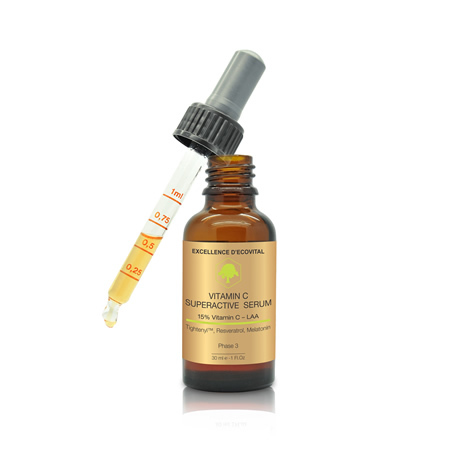 Do not apply the Vitamin C Superactive Serum directly on the wounded skin, or before exposing to the sun. Before using the serum it is best to prepare your skin by lowering its Ph. We recommend using the Excellence D’Ecovital Purifying Cleanser – Phase 1 and the Excellence D’Ecovital Putifying Lotion – Phase 2. It is proven that the cellular absorption of Vitamin C greatly depends on skin’s PH. Formulas with a PH below 4.0 are ideal for transporting the ascorbic acid in Vitamin C into the skin’s deepest cells.If the skin PH is not acidic, the Vitamin C remains at the skin surface and oxidizes. Use it under any day or night cream, but for enhanced results we recommend applying the moisturizers from the Excellance D'Ecovital line. Apply twice a day after cleansing and toning. Pour a small amount and smooth evenly over face, neck and décolletage. Massage the serum into the skin with circular movements, using the fingers. You may feel a warming, active and tightening effect but the sensation will disappear within moments after application. INGREDIENTS: ETOXYDIGLYCOL, AQUA, L-ASCORBIC ACID, VITIS VINIFERA (RED GRAPE) EXTRACT, EUTERPE OLERACEA FRUIT EXTRACT, AVENA SATIVA (OAT) KERNEL EXTRACT, GLYCERIN, SODIUM ANISATE GLYCERIN, DISODIUM ACETYL GLUCOSAMINE PHOSPHATE, SODIUM GLUCURONATE, MAGNESIUM SULPHATE (TIGHTENYL™), MELATONIN, POLYGONUM CUSPIDATUM EXTRACT (RESVERATROL). Very concentrated in all the good things for your skin. Amazing price, as well. I am addicted to this serum. I used to use very expensive ones but now that I found this one I will stick to it. This is a most remarkable vitamin C product, and at a very reasonable cost. I have purchased much, much more expensive products, but this Vit C is superior.